Applications are now open for the Course Design Institute (CDI). The purpose of the Institute is to help faculty apply a best-practice approach to designing dynamic, learning-focused courses in any discipline, in a compact 3-day program. Faculty preparing to teach a new course or those redesigning a course to promote significant, long-term learning should apply to the CDI. 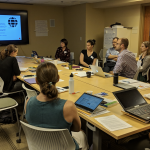 Participants will work through an extensive course design plan to prepare an effective student-centered course where learning goals, assessments, and activities are aligned. View a sample CDI 2018 schedule. Duke Learning Innovation consultants Sophia Stone, Elise Mueller, and Seth Anderson will lead the Institute. Invited faculty and guest speakers will join us throughout the 3-day event. Additional instructional consultants will be available each day to work with faculty one-on-one on their course design needs during the optional consulting time. 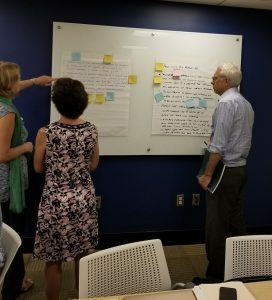 The Course Design Institute was a wonderful opportunity to reflect on my teaching, develop new skills and strategies, and connect with faculty across campus. I now have a better understanding of the resources offered by [Learning Innovation], and look forward to using those to improve my courses. I am going into the new semester feeling very inspired. Each participant will receive $500 in funds deposited to a research account, a copy of the book Creating Significant Learning Experiences: An Integrated Approach to Designing College Courses by L. Dee Fink, and a set of course design resources for use after the Institute. Applications are due Friday, March 9, by 5:00 pm. Applicants will be notified Monday, March 19 on the status of their application. If you have any questions about the program, please contact Duke Learning Innovation.